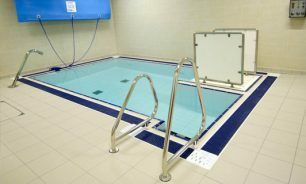 Jules Rudkin and Sue Hayes have taken post-graduate training in gained ATACP accreditation in Hydrotherapy to supplement their Physiotherapy training. The properties of warm water at 35 degrees, mean that you can carry out exercises that you would find difficult or even impossible on dry land. The buoyancy will reduce the load on the joints and supporting muscles and structures. Through specialised exercise, hydro is used to facilitate movement,, provide resistance and allow relaxation. Exercises are selected for you individually and progressed and adapted as you improve. Following trauma and road accidents. Especially useful in multi joint conditions. All sessions are 1:1 and last Approximately 30 mins. You may be in the pool with another therapist with her patient. This for the safety of both the patients and the therapists. You will have an initial physiotherapy assessment on dry land so that any restrictions, precautions or contraindications can be discussed. You may be referred by a consultant, GP, another therapist or by self-referral, but we do need to see you ourselves on land before the first session. This is unless you are already having physiotherapy at Witty, Pask and Buckingham when the therapist would liaise with ourselves directly. Entry into the pool is via the steps or lift. We can also assist patients in on a chair if needed. You may wish to bring poolside footwear, such as flip-flops. You need to bring your own towel and swimming wear. After a hydrotherapy session it is recommended that you sit quietly for 15 minutes with a drink to allow your body temperature to adjust before you go walking outside. It is advisable to have some one with you after the first session in the pool to make sure you have no reactions to the temperature and are safe driving home. Please call 01604 601641 for any further information and for charges. 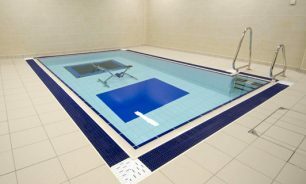 Most health insurances cover hydrotherapy, but you do need to seek authorisation and bring this information to your first appointment.